(CNN) -- I thought I had escaped the daily grind of the 24-hour news business when I went on a weeklong vacation in Mexico with my mom and a friend. I was seeking news-free sun and relaxation in a hypnotic tropical paradise and deliberately powered off my arsenal of PDAs to get a much-needed respite from news and technology. 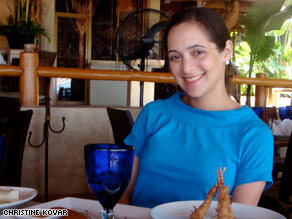 CNN producer Valerie Streit enjoys a meal during her sort-of-relaxing vacation. I did get the sun (burn) and relaxation -- but I also got a side dish of anxiety that I don't remember ordering. The anxiety reared its ugly head along the sun-soaked, art-adorned beach in the Romantic Zone of Puerto Vallarta when I saw dozens of people huddled around a television set on a Saturday afternoon, intently watching Mexican news reports. My heart raced, and so did my thoughts -- first pondering possible drug violence and then considering the possibility of a fresh terrorist attack. As I inched closer to the TV, I discovered that more than 150 people had died of swine flu, or 2009 H1N1, in Mexico City, a mere 550 miles from this beach. Huddled around a television set -- It sounds like a scene from a movie or footage from the day JFK was assassinated, but that was how this full-time (often overtime) news producer found out about the swine flu outbreak. Not by my Blackberry or iPhone, which are often interchangeably wedged to my fingertips like garish nail extensions. What about us travelers already in Mexico, I wondered? The locals seemed mostly at ease, and I didn't see anyone at our resort cutting their trip short to evacuate from paradise. I roused my gadgets from their three-day slumber (full recharges required) and became glued to the news again. And in the days that followed, we received inquiries from worried friends and colleagues back home. Then those things showed up. My friend spotted the first ones on Tuesday: surgical masks sported by bicyclists in Bucerías, a tiny fishing village in Nayarit. The masks quickly became a don't-leave-home-without-it trend. When I left Wednesday, the scene at the airport knocked the caution of the outside world back into me. My carry-on bag contained Mexican milagros (religious charms), expensive tequila and Dia de los Muertos souvenirs but not a single surgical mask to stave off potential illness. After seeing people wearing the masks everywhere I looked in the airport, I decided to follow the trend but couldn't find a single mask for sale. Once I reached the security checkpoint, I was instructed to fill out a questionnaire about whether I had any flu symptoms such as fever, cough, headache, limb and joint pain, eye redness or nasal flux. A fellow traveler -- still in jovial vacation mode -- made light of the questions by asking whether drunkenness was one of the symptoms. Everyone within earshot laughed. We needed a little comic relief at that point. At the departure gate, the attendants gave everyone hand wipes before we boarded the plane. Not all of the airlines were doing this, but at that point I welcomed whatever virus-killing option was offered to me. Now, back home in Atlanta, I'm happy to report that I'm flu-free -- despite edging on hypochondria. Maybe I need a post-vacation vacation? Oh, and I want to give a quick shout-out to my friend Steve, who had to cancel his trip to Puerto Vallarta next week. Sorry, Stevo, next time the tequila is on me.